Cognitive Behavior Therapy (CBT), the most validated form of psychotherapy in the early 21st century, demonstrates that irrational thoughts create feelings of depression and anxiety while rational thoughts create feelings of confidence and trust that lead to accomplishment and improved relationships. I have used CBT as part of a program for self-transformation with clients and students of Integral Deep Listening for over twenty years, with good results. I have explained how anyone can easily use this powerful tool to improve their lives in Waking Up. While CBT is very effective at neutralizing negative emotions, it is less effective at creating positive emotional states. Consequently, many people are not drawn to CBT because they don’t want to just escape misery; they want to experience positive feelings. Emotional neutrality is associated with boredom or a lack of excitement in life for people who have been addicted to their feelings. To get them to simply stop feeling is not realistic. In addition, that is not the goal, since emotions are important for a healthy life. The idea is to dial down negative and reactive emotions that create a roller-coaster of emotion and experience while increasing positive emotional responses in everyday situation. The problem is that many positive feelings are phony or destructive. When you repeat, “Every day, in every way, I am feeling better and better,” you may be telling yourself something you don’t believe. The result is that positive affirmations can feel like a form of self-brainwashing. Some feelings, like wanting to eat chocolate, have a drink, or smoke a cigarette, are positive because they rescue you from some unhappiness or stress, yet can strengthen addiction and further misery. While positive states are not permanent developmental stages, returning to positive states routinely creates them. Authentic positive emotions that are aligned with the nature and priorities of your inner compass do not merely neutralize negative emotions; they work as antidotes, or powerful counteracting medicine, that rewards and reinforces the act of relinquishing a negative feeling. Breath Anchoring is simple. You will be led through a process in which you will identify a personification of a desired emotion, such as confidence. You will then list times in your life when you habitually find yourself anxious, worried, or afraid. You will then imagine you are in one of those troubling situations and give those negative feelings a score between zero and ten that reflects their intensity. Next, you will imagine you are the personification of the desired emotion that you created earlier, such as confidence. You will then use either one or two physical anchors to “ground” your awareness in the experience of confidence. You will ground your confidence or other positive feeling in an associated stage of the cycle of your breathing. In addition, for four of the negative emotions you can also place your hand over either your abdomen or chest to anchor your positive feeling state. You will then use awareness of your breath to amplify and strengthen your experience of this or that positive feeling, such as confidence. Finally, you will again score the intensity of your negative feeling, zero to ten. Is it stronger, weaker, or the same? Why? What happened? It is recommended that you choose the one that gives you the most trouble and work on it first. Before you add a second, follow the protocol for the first for at least a week. You need whatever time is necessary to feel comfortable that you are remembering and charting your progress with the first before you add a second. When you use this simple process, you are doing three things. First, you are interrupting your negative emotional state. You do this when you recognize that you are in it and decide to use breath anchoring. Second, you are substituting something else for that emotional state. While interrupting any problem behavior or emotion is helpful, substitution is generally more effective because it provides something positive – a reinforcement or a reward. Third, you are substituting a personally-designed antidote emotional experience that is tailor-made to substitute for your problem emotional state. Consequently, it will feel authentic when you use it, because it is authentic, reducing your resistance and increasing its effectiveness. Whether you are working with the six negative states addressed here or some other emotional problem, the procedure for creating an antidote is the same. First, think of a time in your life when you remember having had a positive experience. If the target feeling is worry, anxiety, or fear, think of a situation or time when you felt confident. If the target feeling is tiredness, think of a situation or time when you felt energized and alive. If the target feeling is imbalance, think of a situation or time when you felt in balance. If the target feeling is criticalness, think of a situation or time when you felt very accepting toward yourself. If the target feeling is stress, think of a situation or time when you felt at peace. If the target feeling is drama, think of a situation or time when you felt objective and clear. In each instance, write down or describe out loud the situation and how you felt. This helps bring the feeling alive for you so that you can successfully take the next two steps, naming the color or colors it reminds you of, and allowing those colors to take the shape of whatever animal, object, or plant that it wants. For example, one student was working to counteract a troubling habit of being fearful of the criticism of others. Since this is a fear, he thought of a time in his life when he felt confident. He realized that he felt confident when he was helping others and he associated it with a golden yellow color. When he watched that color condense or congeal into a form, it became a golden, spinning, top. He had now created an emerging potential that personified confidence. If the answer is fear (worry, anxiety), focus on your abdominal inhalations to build confidence; carry that confidence around the six parts of your breath for three breaths and see how you feel. If the answer is personalization (“What are they thinking/saying about me?”), focus on your chest inhalations to build aliveness and compassion that will help you outgrow a small, self-centered way of feeling; carry that compassion around the six parts of your breath for three breaths and see how you feel. If the answer is “out of balance,” focus on the space at the top of each breath to build balance and wisdom; carry that sense of balance around the six parts of your breath for three breaths and see how you feel. If the answer is judgment, criticalness, or addictive desire, focus on your chest exhalations to build detachment and acceptance; carry that sense of detachment and acceptance around the six parts of your breath for three breaths and see how you feel. If the answer is stress, focus on your abdominal exhalations to build inner peace; carry that inner peace around the six parts of your breath for three breaths and see how you feel. If the answer is drama (being in one of the roles of the Drama Triangle), focus on the longer pause at the bottom of your breath to build clarity, objectivity, and witnessing; carry those qualities around the six parts of your breath for three breaths and see how you feel. Get in touch with how confident you feel in that situation. If that confidence had a color, what would it be? When you become your personification of confidence, how do you feel? You should feel the confidence that you felt before, but now it is personified or embodied as a particular form. Now place your hand on your abdomen. While imagining you are your character, observe your abdominal inhalation. With each abdominal inhalation, feel your awareness of yourself as that character grow. Let each breath build on the last, creating greater confidence. As the personification of your confidence, observe each abdominal inhalation filling you with confidence. Carry that confidence through the cycle of your breath. Score your anxiety, worry, fear again, 0-10. Listing problematic daily situations alerts you to the presence of worry, anxiety, or fear, to help you remember that when those situations arise, that is a sign that it is time to become the tricycle, put your hand on your abdomen, and shift your awareness to your abdominal inhalations. At the end of your day, look over the list. Did you remember to become your character, place your hand over your abdomen, and abdominally inhale confidence? If you did, put a check by the situation. Every night, before you go to bed, look over you list and make a check for each time you remembered to practice your confidence breath anchoring exercise. After a week, see how many checks you can generate for each item. You will increase your success even more if you will share your progress each week with a friend, colleague, or IDL Practitioner, as a form of accountability for yourself. It will help you to stay on track so that you don’t just bury this exercise under the avalanche of other life priorities. In confidence I had a pink pig sitting on a hill watching the sunrise. In the habitual experience of fear I felt worrying about the future. As my pig I just enjoyed the present moment and only felt a bit of excitement. My example of fear grow from four to seven. With my pig it only was at one! Get in touch with how alive you feel in that situation. If that aliveness had a color, what would it be? When you imagine you are that character, how do you feel? You should feel the aliveness that you felt before, but now it is personified or embodied as a particular form. Now place your hand on your chest. While imagining you are your character, observe your chest inhalation. With each chest inhalation, feel your awareness of yourself as that character grow. Let each breath build on the last, creating greater aliveness. As the character, observe each chest inhalation filling you with aliveness. Carry that aliveness through the cycle of your breath. Score your tiredness again, 0-10. Listing problematic daily situations alerts you to their presence, to help you remember that when those situations arise, that is a sign that it is time to become your character, put your hand on your chest, and shift your awareness to your chest inhalations. Every night, before you go to bed, look over your list and make a check for each time you remembered to practice your confidence breath anchoring exercise. After a week, see how many checks you can generate for each item. You will increase your success even more if you will share your progress each week to a friend, colleague, or IDL Practitioner, as a form of accountability for yourself. It will help you to stay on track so that you don’t just bury this exercise under the avalanche of other life priorities. One student said that he often felt tired mid-day and evenings, and gave that tiredness an average score of seven. When he felt most alive was when he was out in nature. He associated that feeling of aliveness with golden yellow, and it turned into the sun. When he became the sun while placing his hand over his chest and inhaling its aliveness, for five breaths, he scored his tiredness at a two or a one. Another student felt tired when she experienced herself as a victim and wanted to get out of situations but couldn’t. She rated her tiredness as a seven or an eight. When she thought of times in her life when she felt alive, a blue whale presented itself as a personification of aliveness. “As my whale I first experienced compassion with myself in the situation and more awake in the present moment, so that the physically tiredness in the seminar was gone for the moment.” At that time, with her blue whale, she rated her tiredness toward the habitual situation at five, but her tiredness in the moment of the exercise was at zero to one. Get in touch with how balanced you feel in that situation. If that balance had a color, what would it be? When you become that character, how do you feel? You should feel the balance that you felt before, but now it is personified or embodied as a particular form. With each pause at the top of your breath, feel your awareness of yourself as your balanced character grow. Let each breath build on the last, creating greater balance. From the perspective of your balanced character, observe each pause at the top of your breath filling you with balance. Carry that balance through the cycle of your breath. your pause at the top of your breath. Score your out of balance again, 0-10. Listing problematic daily situations alerts you to their presence, to help you remember that when those situations arise, that is a sign that it is time to become your character and shift your awareness to your pause at the top of your breath. Every night, before you go to bed, look over your list and make a check for each time you remembered to practice your aliveness breath anchoring exercise. Did you remember to become your character and experience balance at the pause after inhalation and before exhalation? If you did, put a check by the situation. After a week, see how many checks you can generate for each item. One student of IDL said that she found herself habitually out of balance when she takes things personally, giving it a strength of “eight” on the zero to ten scale. When asked to personify colors associated with experiences of balance, she said, “rolling green hills.” When she became those rolling green hills she felt more balanced. She took both the sense of being the rolling green hills and their balance into the pause after inhalation and before exhalation, to that balance point in her cycle of breathing. She then carried that sense of being balanced through her exhalation and around through her inhalation. At the next inhalation she again became the rolling green hills and amplified the feeling of balance that they gave her. She continued this process for five breaths. When she scored herself again her sense of imbalance was two. Get in touch with how accepting you felt in that situation. If that acceptance had a color, what would it be? When you become your personification of acceptance, how do you feel? You should feel the balance that you felt before, but now it is personified or embodied as your particular form. As that form, observe your chest exhalations. With each chest exhalation, feel your awareness of yourself as that form grow. From the perspective of your character, observe each chest exhalation filling you with balance. Score your critical again, 0-10. This is to prime you to their presence, to help you remember that when those situations arise, that it is a sign that it is time to become the water, put your hand on your chest, and shift your awareness to your chest exhalation. Every night, before you go to bed, look over your list and make a check for each time you remembered to practice your acceptance breath anchoring exercise. Did you remember to become your character, put your hand on your chest, exhale and experience acceptance? If you did, put a check by the situation. After a week, see how many checks you can generate for each item. One student found herself feeling critical about her procrastination. She gave it a “four” on the zero to ten scale. Water was the emerging potential that personified acceptance for her. When put her hand on her chest, became Water, felt its acceptance, and observed her chest exhalations, allowing the feeling of acceptance to grow with each breath, she found that her criticalness disappeared entirely. Get in touch with how at peace you felt in that situation. If that peace had a color, what would it be? When you become your personification of inner peace, how do you feel? You should feel the peace that you felt before, but now it is personified or embodied as your emerging potential. As your personification of inner peace, place your hand on your abdomen. With each abdominal exhalation, feel your awareness of yourself as your emerging potential grow. Let each breath build on the last, creating greater peace. From the perspective of your character, observe your abdominal exhalation filling you with peace. Carry that peace through the cycle of your breath. Score your stress again, 0-10. This is to prime you to the presence of unnecessary feelings of stress, to help you remember that when those situations arise, that is a sign that it is time to become your personification of inner peace, put your hand on your abdomen, and shift your awareness to your abdominal exhalation. Every night, before you go to bed, look over your list and make a check for each time you remembered to practice your inner peace breath anchoring exercise. Did you remember to become your character, put your hand on your abdomen, exhale, and experience inner peace? If you did, put a check by the situation. After a week, see how many checks you can generate for each item. One student identified a recurring stressful emotional situation as feeling stressed about his weight and eating too much. It was not a strong stress, only a “three,” but still important to him. The emerging potential with strong inner peace that presented itself to him was a tree. When he became it, he felt strong inner peace. When he placed his hand on his abdomen and observed his abdominal exhalation for a series of breaths, deepening and broadening his sense of inner peace with each abdominal exhalation, he discovered that his sense of stress was gone. Now rate how strong your stress is, zero to ten, with zero being out of drama and ten being very much in drama. Get in touch with how clear you felt in that situation. When you become your personification of clarity, objectivity, and witnessing, how do you feel? You should feel the clarity that you felt before, but now it is personified or embodied as a particular form. As your character, observe the pause after exhalation, called the “bottom” of your breath. With each pause after exhalation, feel your awareness of yourself as the clear, objective character grow. Let each breath build on the last, creating greater clarity. From the perspective of your clear character, observe your pause after exhalation filling you with clarity. Carry that clarity through the cycle of your breath. This is to prime you to their presence, to help you remember that when those situations arise, that is a sign that it is time to become your personification of clarity and shift your awareness to the pause after exhalation. Every night, before you go to bed, look over your list and make a check for each time you remembered to practice your drama-avoidance breath anchoring exercise. Did you remember to become your character, shift your awareness to the pause after exhalation, and experience clarity, objectivity, and witnessing? If you did, put a check by the situation. After a week, see how many checks you can generate for each item. One group member said she got into drama when she felt criticized by her partner and felt angry. On the zero to ten scale she felt she was an “eight” in drama at those times. When she became her dog, she felt very clear and objective. This surprised her, because she thinks of dogs as subjectively immersed in their emotions. When she amplified her awareness of herself as her dog with each recurring pause after exhalation, her sense of drama left her completely. She felt a zero in drama. Why can’t you use any image? You can. However, even a universal image like the sun, a rainbow, mountain, or water will not necessarily bring up the connotations that you intend. The sun could bring up thirst or uncomfortable heat; a rainbow, illusion; a mountain, unattainable goals; water, fear of drowning. In addition, IDL does not emphasize images chosen by your waking mind but images that emerge spontaneously out of your experience, like dreams do. This reflects a desire to surrender control and share power with your inner compass, based on the idea that you have a healer within, an inner gyroscope, and access to perspectives that know why and how “you” are stuck and what you need to do to get unstuck. While breath anchor images are self-created, they are more than self-aspects. They are more than who you think you are, and they cannot be simply relegated to unconscious, subconscious, or superconscious regions of some hypothesized larger self. They reflect potentials that you have yet to grow into, to identify with, to become. They are indeed greater than you are, yet they are not destiny. You don’t have to become them. Your growth could take you in another direction. However, when you become them they are emerging as realities for your consciousness and your identity. Consequently, they are emerging potentials. Why associate an image with breath? Imagery, like thought and feelings, can feel detached from the physical sense of who you are. IDL has a decided preference for the here and now, which includes being in a body. Breath grounds you in your body. Whether you like your body or not, you co-exist with it and it is wise to make the most of that relationship. Grounding yourself in your body gives your life foundation, and your breath is a powerful way that is immediately available to you as long as you are alive. What are the six parts of each breath? Abdominal inhalation, chest inhalation, pause, chest exhalation, abdominal exhalation, and a longer pause. Why associate certain qualities with certain parts of a breath? Your breath is a microcosm, a reflection of the microcosm. Every time you breathe you re-enact the drama of birth, growth, balance, detachment, death, and transcendence. You also recapitulate the round of your daily life: awakening, aliveness, balance, detachment at the end of a day’s work, freedom in drifting off to sleep, and the clarity of deep sleep. Each of these phases of the macrocosm of your life can be associated with qualities. Here they are, in order: confidence, compassion, wisdom, acceptance, inner peace, and witnessing. For example, when you associate an image that authentically generates confidence with abdominal inhalation, you give yourself a way to move out of fear and into confidence at any time, in a way that feels authentic and, in that moment, is effective. You have a person think of a past time when they were afraid, tired, unbalanced, critical, stressed, or in drama, have them rate that, and then have them rate their current sense of a positive feeling. Aren’t those two different times and feeling states? Yes. A past episode of a habitual disturbing emotion is used to get you in touch with your “normal” sense of the intensity of a feeling when it arises, using the zero to ten scale. You are then experiencing what happens to that feeling when you substitute an authentic, self-generated experiential antidote to it. The goal is to generate an effective tool to use whenever you feel a particular habitual disturbing emotion. For example, one lady had a pig sitting on a hillside watching a sunrise. When she imagined she was this pig, she experienced great confidence. Her challenge is to remember to become the pig, put her hand on her abdomen, and practice amplification of abdominal confidence with repeated breaths whenever she feels worried, anxious, or scared. Why do you score twice? The reason for the second scoring is to give you a comparison as a test of the method. Did your habitual disturbing fear/tiredness/imbalance/criticalness/stress/drama increase, decrease, or stay the same after you went through the steps of breath anchoring? Do I have to pair a particular hand placement with a particular part of the cycle of breathing? For instance, do I need to lay my hand on my abdomen and focus on my abdominal exhalations to reduce my stress and increase my inner peace? No, but there is a rationale for the steps of breath anchoring. The association of a particular quality, in this case inner peace, with abdominal exhalation, laying your hand on your abdomen while observing your abdominal exhalations, and carrying a growing sense of inner peace around the cycle of breath several times, is designed to strengthen your experience of inner peace as an antidote to stress. 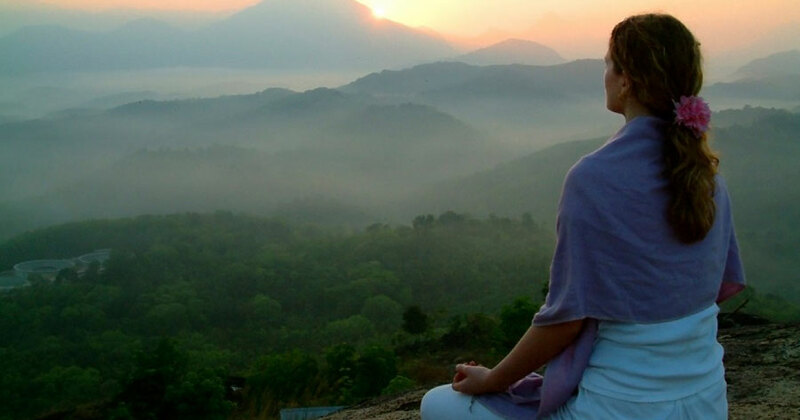 More tools for using breath for centering can be found in Waking Up, by this author.